jim redcorn was a friend and regular visitor to our house during the time he lived in oklahoma city in the 70's and early 80's. he also welcomed us to the osage dances in pawhuska. he moved back to his home studio in pawhuska and we all saw him less. he died some time ago while living in pawhuska. jim's son talee printed a poem online that jim had written causing me to think back on him and be determined to write a few words remembering him. jim was an old school indian artist trained in santa fe and mentoring others including richard whitman who came after him. he painted in gouache or watercolor and favored images of his osage tribe. he proudly claimed knowledge from classic european painting. he came to oklahoma city in the 70's to head a project documenting undercounting of indians in the census working with our friend helen fourkiller among others. art remained his real love and he was particularly proud of an ornately framed oil painting that hung on the wall of the border crossing restaurant in norman. Of my people, the Osage. "The Playground of the Eldest Son"
The oldest son is our most favorite. The viewers will know it. 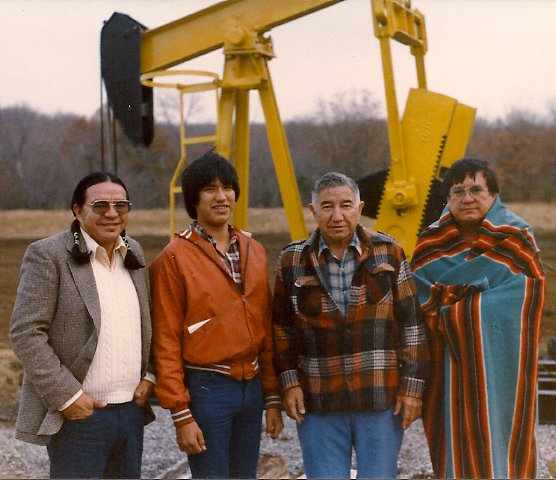 * Pictured in the photo are Jim's brother Charles, his son Talee, his father Harold and Jim. I have no idea why he wore the blanket that day but somehow i'm not surprised.